I’m a huge proponent of eating together as a family – especially when there are young children around. I know too many families who make a quick meal for the kiddos, then sit down later for their own dinner after the young ones have gone to bed. The excuse I often hear is that it just takes too much time to get a meal whipped up for everyone. It just doesn’t make sense to me – aren’t those people taking up MORE time by making two meals? If not, what are those kids eating? Parents are powerful role models for their children. I can’t even tell you how many families come in for counseling on “picky eating” in their toddlers, only to hear that daddy won’t eat vegetables or that instead of sitting down herself mommy just picks off the kids’ plates. We’re conditioned to think that kids will only eat bland, “kiddie” food such as macaroni and cheese, hot dogs and french fries, but that is simply not true. And while kids are notoriously finicky, I find that pickiness at the table is less of a function of the kid not liking what’s in front of him or her, but rather because that kid has been fed snacks throughout the day and simply isn’t hungry. Or because that kid is accustomed to getting what he/she wants if he asks (ok, whines) for it long enough. Plan ahead. Have a list of go-to meals that take only 30 minutes or less to prepare, and stock your kitchen with ingredients for those meals – especially for those harried weekday dinners. If weekends is the only time you can get it together and have everyone sit down together, so be it. Serve yourself from the stove, not family-style at the table. If you’re really counting calories, measure portions so you know exactly what you’re getting (check out www.mypyramid.gov for an idea of what a serving of meat, grains, veggies and so on would be). Serving food away from the table and out of sight cuts down on the urge to reach for seconds. If your child must eat something different from what’s being served (for example, if the dish is very spicy or contains allergens the child needs to avoid), give the child only 2-3 options from which to choose. Simply asking “what do you want for dinner” each night will inevitably lead to a recurring favorite. 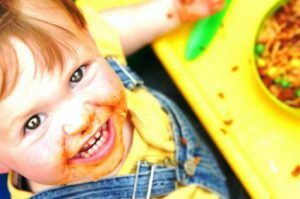 Saying, “do you want tortellini, chicken or meatballs” gives the child a sense of control while still providing clear boundaries. Don’t serve as a short-order cook. You’re the parent, and the child made his/her decision on what to eat. If he/she won’t eat it, don’t reach for the fridge to whip up another option. More often than not this is a control issue for the child and not a food preference. Last but certainly not least – turn off the TV. Make dinnertime sacrosanct. It’s a time to reconnect as a family, share the events of your day, and especially for working moms and dads – give your child that uninterrupted interaction they love.